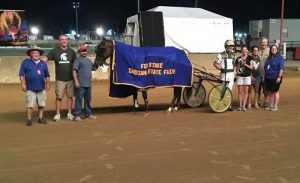 Although rain showers popped up all day long in Central Indiana, the first day of harness racing at the Indiana State Fair got underway Wednesday, Aug. 8. The races were delayed, but the first of several divisions of the Hoosier Stakes stepped on the track at 7:15 p.m. and was completed just before 11 p.m. with the 92nd Fox Stake. Early in the 15-race card, it was driver Michael Oosting that was having the best program, scoring four wins in the first 13 races. Trainer Erv Miller was also off to a fast start with a training triple on the card. Sam Widger also picked up driving triple, scoring his first win with Kak’s Rockin for trainer Jeff Cullipher. The two-year-old daughter of Rockin Image moved down the backside and soared to the lead, scoring the victory by two and three-quarter lengths over Slymar’s Dragon and Mark Evers in 1:57.0. Owned by Cullipher and Tom Pollack, Kak’s Rockin earned her second win of 2018 in six starts. She topped $20,000 in earnings on the year with a win in a division of the Hoosier Stake No. 82 for filly pacers. Widger also scored the fastest mile of the night in the Horseman 110 three-year-old pace with Rockin Speed. The Rockin Image gelding rallied to the front at the head of the lane and never gave up, getting the win by a neck over American Chrome and Brandon Bates in 1:52.0. Owned by L & L Devisser, Rockin Speed is trained by Joe Seekman. It was the second win of the year for Rockin Speed and a new lifetime mark. The two featured races of the night were the final two on the card, the $28,032 Ralph Wilfong Memorial for two-year-old trotters and the $44,868 Fox Stake 92 for two-year-old pacers. Driver John DeLong scored wins in both events, guiding Memo to victory in the Wilfong Memorial and Always a Vavoom in the Fox Stake. Trained by Tony Alagna, Memo sat patiently in the two hole before tipping out and trotting home for the win in 1:57.2 over Lite Years Away and LeWayne Miller. Brittany Farms LLC owns memo, who is a home bred by Trixton. Always A Vavoom was a gate to wire winner in the Fox Stake. DeLong got the jump on the field and sailed under the wire with the freshman son of Always A Virgin by two and one-half lengths in 1:53.3. Roger Welch trains the colt for W. Patrick DeLong and William DeLong of Wisconsin. DeLong scored a driving triple for the night. 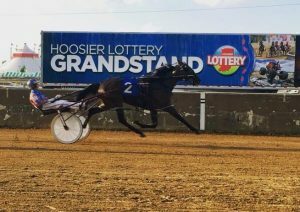 He also connected with the Jenny Melander-trained Smooth Aceleration in a division of the Hoosier Stake 82 for two-year-old colt trotters in a time of 1:58.4. The Fox Stake completed the first day of racing at the Indiana State Fair at 10:45 p.m. Racing resumes at 11 a.m. with the Indiana Sired Fair Circuit consolation races followed by a 6 p.m. racing program for the ISFC Championships Thursday evening.